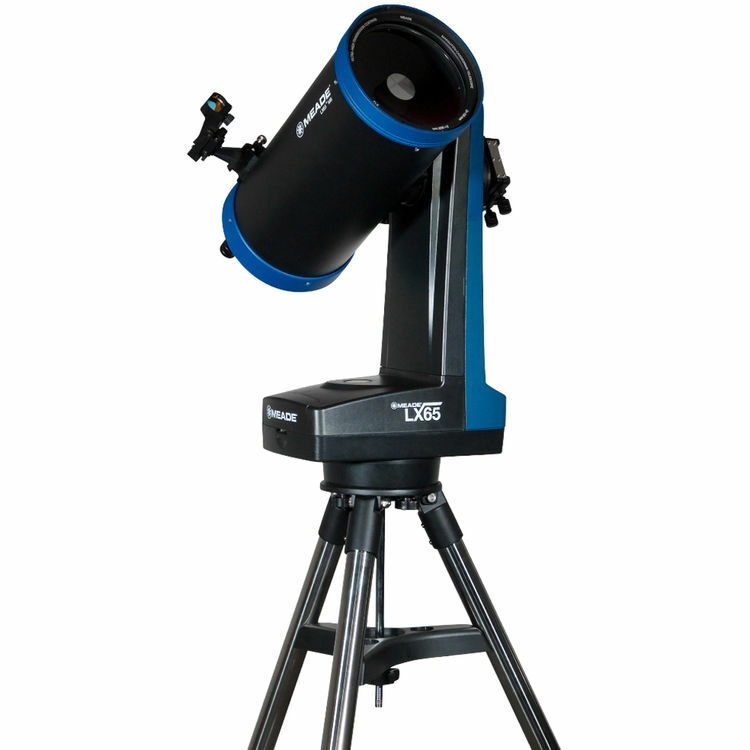 Designed as an entry- to mid-level astronomical observation platform, the Meade Instruments LX65 6" f/12 Maksutov-Cassegrain GoTo Telescope gets a boost in aperture from the smaller 127mm model with a shorter focal length, which equates to a faster focal ratio to improve resolution and shorten exposure times. 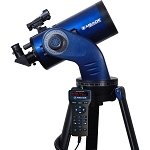 The scope gives users the ability to make detailed observations of the Moon and planets with the ability to reach outside the solar system to resolve distant objects like galaxies, nebulae, and binary or variable stars. 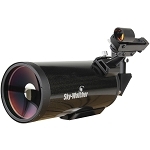 The compact and powerful Maksutov-Cassegrain design, complemented by Meade's Ultra-High Transmission Coatings (UHTC) system, corrects off-axis aberrations like comas and chromatic aberrations to produce views with true-color rendition and high resolution and contrast. 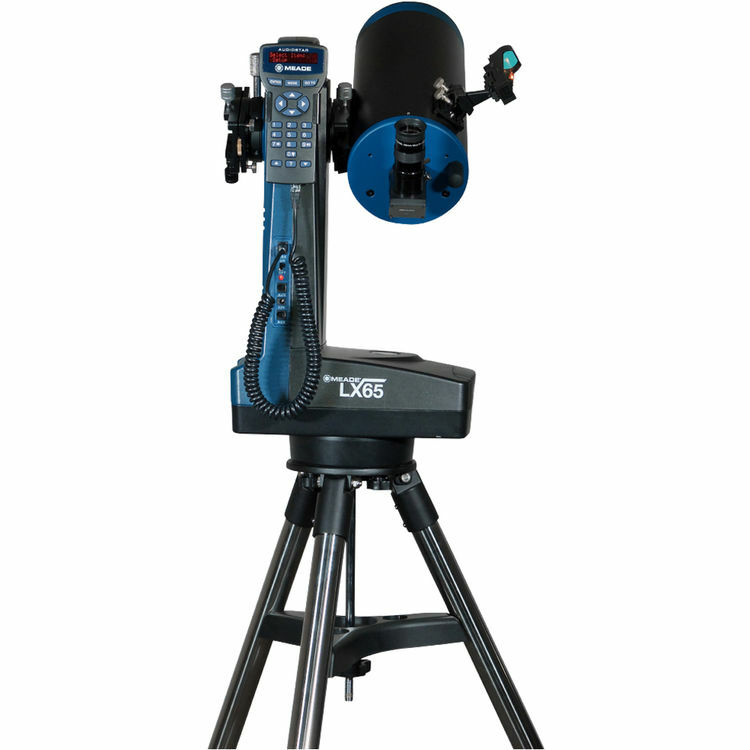 The LX65 optical tube assembly (OTA) is carried by a motorized single-arm fork mount that is designed for portability and versatility. It is equipped with two Vixen-style dovetail saddles that allow you to mount the Maksutov OTA on the primary and mount a secondary OTA or camera rig on an outside saddle. The mount has an integrated handle to make setup and breakdown easier and safer, and a battery compartment for the eight C-cell batteries required to run it and the controller. A stainless steel tripod with a center leg lock that improves stability and dampens vibrations supports the mount and OTA. The brain of the LX65 is the venerable AudioStar computer controller. Equipped with a database of over 30,000 objects, including the planets, stars, nebulae, galaxies, and the complete Messier catalog, it can also be programmed with custom user-defined objects. 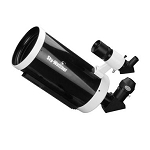 Its intuitive menu-driven user interface provides the power to observe the heavens with ease, especially with features such as guided tours, extended information on popular objects, and multiple alignment options. This updated version of the AudioStar has an integrated speaker so you can listen to a narration about what you are looking at without having to divert your eye or attention from the eyepiece, for added enjoyment.